A tractor driver hungry for pizza has been arrested on suspicion of drink and drug driving in a city centre. 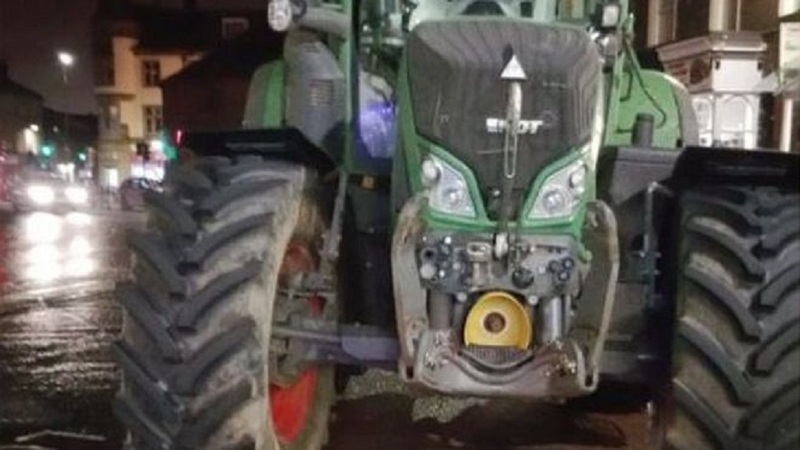 Cumbria Police officers were confronted with the unusual sight of a large, green tractor parked in The Crescent, Carlisle, in the early hours. Officers tracked the driver down who had driven the vehicle into the city because he fancied a pizza. The force tweeted a picture of the tractor , which has been re-tweeted dozens of times, alongside the caption: ’Driver of this trying to get pizza in Carlisle. ’Arrested drink/drug driving #DrugWipeUK #Unlucky #Hungry #FatalFour’. This incident comes a month after a young farm worker was fined by police after admitting driving around a city centre in a tractor ’looking for women’. Anthony Breslin, 18, from Burnfoot, was caught driving his tractor around Londonderry on August 16. He admitted one charge of driving a tractor without displaying L-plates. Breslin’s solicitor said: "We all know tractors are all about pulling power, but this is taking it to the extreme."